Two chilling icons come together for a good cause on October 1 in Eureka Springs. New York Times bestselling author, Charlaine Harris will appear at America’s Most Haunted Hotel to raise funds for Eureka Springs Writers Colony at Dairy Hollow. HBO True Blood Series is based on novels by Charlaine Harris. Harris will appear in Eureka Springs October 1, 2011. True Blood is an HBO series based on The Southern Vampire Mysteries novels by Charlaine Harris. Stories detail the co-existence of vampires and humans in Bon Temps, a fictional, small town in the state of Louisiana. The series centers on Sookie Stackhouse, a telepathic waitress who falls in love with vampire. The series has received critical acclaim and won a Golden Globe and an Emmy. True Blood is broadcast on HBO. Charlaine Harris is a member of the Mystery Writers of America, the American Crime Writers League, Sisters in Crime, and the International Crime Writers Association. She is also a past member of the boards of Sisters in Crime and MWA and is a member of Science Fiction Writers of America, Horror Writers Association, and Romance Writers of America. 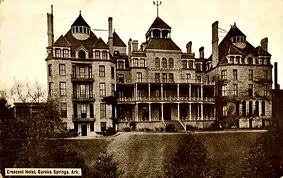 Historic photo of the 1886 Crescent Hotel, also known as America's Most Haunted Hotel. The 1886 Crescent Hotel has gained a reputation as America’s Most Haunted Hotel. Having undergone several documented paranormal investigations including the televised investigation by TAPS, Crescent Hotel history lends itself to fascinating ghost stories. Most recently, Crescent stories were shared on Biography Channel’s My Ghost Story. This most recent story is thought to parallel that of the famous dancer Irene Castle. Read more about Irene Castle and the Crescent Hotel in Behind the Story of Biography Channel’s My Ghost Story. Now over a decade old, the Writers Colony attracts writers from around the world (44 countries) and more than 850 writers throughout the United States. Providing uninterrupted residency time for writers of all genres including songwriters and composers, culinary writers, architects and play writes, the Writers Colony is the only one in the world which not only recognizes culinary writing, both non-fiction and fiction, as a legitimate writing genre, but also provides a state-of-the-art kitchen in our Culinary Suite. Charlaine Harris, in her first Northwest Arkansas appearance, will be in attendance at The Crescent Hotel Conservatory Saturday afternoon Oct. 1, from 1-3 p.m. and will visit with attendees. Tickets are $50 and include a buffet and cash bar. Tickets can be reserved by calling the Writers’ Colony at (479) 253-7444 as seating is limited. 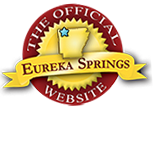 For more information on upcoming events in Eureka Springs visit the Official Eureka Springs Calendar of Events. This entry was posted on September 11, 2011 by estcblog in Crescent Hotel, Ghosts, Things to Do and tagged America's Most Haunted Hotel, Arkansas, Eureka Springs, famous authors, historic hotels, local culture, Writers Colony at Dairy Hollow.